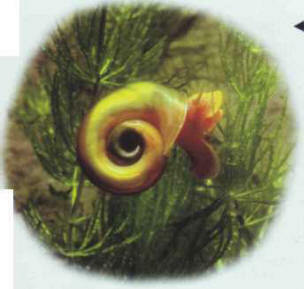 These are water snails with a flattened shell. Their orange-red body contains plenty of red globules to establish a high oxygen concentration, as they live in environments lacking in oxygen and breathe through their lungs, sometimes rising to the water surface. They graze on both short and filamentous green algae, whose growth they help to restrict. Size: 3-4 cm. СТАВРОВ Перикл Ставрович (1895-1955) , русский писатель. С нач. 20-х гг. жил в Париже. Сборники стихов: "Без последствий" (1933), "Ночью" (1937). Рассказы. Переводы.